For the academic journal, see Iranian Studies (journal). Iranian studies (Persian: ايران‌شناسی‎ Īrānšenāsī), also referred to as Iranology and Iranistics, is an interdisciplinary field dealing with the study of the history, literature, art and culture of Iranian peoples. It is a part of the wider field of Oriental studies. Iranian studies is broader than and distinct from Persian studies, which is the study of the modern Persian language and literature specifically. The discipline of Iranian Studies focuses on broad trends in culture, history, language and other aspects of not only Persians, but also a variety of other contemporary and historical Iranian peoples, such as Azeris, Kurds, Lurs, Gilakis, Talysh, Tajiks, Pashtuns, Ossetians, Baluchis, Scythians, Sarmatians, Alans, Parthians, Sogdians, Bactrians, Mazandaranis, etc. 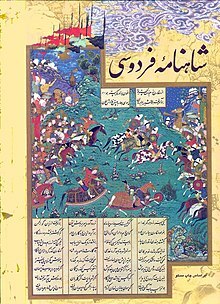 The medieval Iranian poet Ferdowsi, author of the Iranian national epic the Shahnameh, can be considered the "founder" of Iranian studies in the sense that in his work he made a deliberate effort to highlight Persian culture prior to the Arab conquests. In this sense Ferdowsi's nationalistic approach can be contrasted with that of Muhammad ibn Jarir al-Tabari, the famous ninth-century Iranian historian whose History of the Prophets and Kings reflects a more specifically Islamic perspective. Ferdowsi's work follows earlier semi-historical works such as the lost Sasanian-era Khwaday-Namag. Persian historiography strictly speaking begins with the Tarikh-i Mas'udi of Abulfazl Bayhaqi (995-1077), whose fluent prose style was highly influential on subsequent Persian literature. Persian historical writing reached its peak two centuries later with the Jami al-Tawarikh of Rashīd al-Dīn Fadhl-allāh Hamadānī (1247–1318). Other important historical works include the Tarikh-i Jahangushay by Ata-Malik Juvayni and the Zafarnamah of Sharaf ad-Din Ali Yazdi, a history of the Mongolian conqueror Timur (Tamerlane; 1370–1405). Among the most prominent scholars of Iranian Studies in Iran during the twentieth century may be counted Badiozzaman Forouzanfar, Abdolhossein Zarrinkoub, Zabihollah Safa, Mojtaba Minovi, Mohsen Abolqasemi, Ahmad Tafazzoli, Alireza Shapour Shahbazi,and Fereydoon Joneydi. The Loghat-nameh of Ali-Akbar Dehkhoda is the largest comprehensive Persian dictionary ever published, in 15 volumes (26, 000 pages). European scholarly interest in Iranian language and civilization dates back to the late eighteenth century, with the emergence of comparative Indo-European linguistics and the translation of the Avesta by French scholar Abraham Hyacinthe Anquetil-Duperron. British interest in Persian was spurred by the fact that it was the administrative language of much of India; German scholars were attracted by the purported cultural links with Iran as a fellow "Aryan civilization". The major European scholarly organization devoted to Iranian Studies is the Societas Iranologica Europea. The London-based Iran Heritage Foundation supports Iranian studies at several universities and sponsors a wide range of public cultural events. The first major American Iranist was Columbia University Professor A. V. Williams Jackson (1862-1937), a scholar of Indo-Iranian languages who is known for producing a grammar of the Avestan language. During the 1950s Richard Frye developed Iranian Studies at Harvard. An Iranian Studies program was created at UCLA in 1963 in the Department of Near Eastern Languages and Cultures (NELC) that was established by Wolf Leslau a few years before, in 1959. The doctoral Program at UCLA (now the largest program in North America), was the home institution of Professor emeritus Hanns-Peter Schmidt who used to read Old Iranian and Old Indic (Indo-Iranistik), and is now led by M. Rahim Shayegan who also specializes in Ancient Iran. Other Universities where Iranian Studies are offered include the University of Chicago; Princeton University; Indiana University, Bloomington; and the University of Toronto. The Society for Iranian Studies (now the International Society for Iranian Studies) was founded by a group of Iranian graduate students in 1967 and began producing a journal, Iranian Studies. The field expanded considerably during the 1970s, with a number of Americans having served in the Peace Corps in Iran taking up academic positions. Close relations between Iran and the US facilitated the growth of academic programs as well as the Asia Institute in Shiraz and the American Institute of Iranian Studies. The 1979 revolution initially reversed this trend; American academic centers in Iran were closed and their assets seized. Over the past three decades, lack of funding and the difficulty of research travel to Iran have been major obstacles to scholars based in North America. Nevertheless, the field has seen some important achievements such as the monumental Encyclopedia Iranica project led by retired Columbia University professor Ehsan Yarshater. In recent years several new centers for Iranian Studies have been established, notably at the University of California-Irvine, and the University of Maryland. Iranian Studies "initiatives" have been launched at the University of Toronto and the University of Oklahoma. 1748 French map by Le Rouge titled "L'Empire de Perse". The Yarshater lectureship is today the most prestigious honor in the field. Cyril Toumanoff (1913 – 1997) - Russian-born American historian and genealogist who mostly specialized in the history and genealogies of medieval Georgia, Armenia, Iran and the Byzantine Empire. "Guide to Sources on Iran: Bibliography". British Library. University Library. "Middle East Studies and Research: Iran". Course & Subject Guides. USA: University of Pittsburgh. Library. "Iranian Studies". Guides. Canada: McGill University. This page was last edited on 12 April 2019, at 14:39 (UTC).